Learn step-by-step what Excel worksheets are and what to do with them. Learn how to add, rename, move, copy and delete worksheets in a few easy steps. Excel Worksheets, by default, are named Sheet 1, Sheet 2, Sheet 3 and so on. Providing more meaningful names helps you identify a particular worksheet. ► Choose Format ► Sheet ► Rename from the menu bar. Type a new name for the Worksheet. ► Double-click on the Worksheet tab's name. ► Right-click on the Worksheet tab's name and choose Rename from the shortcut menu. You'll notice that any of these methods selects the text in the tab. Just type the new sheet name directly on the tab and press ENTER once you're done. Sheet names can be up to 31 characters. Spaces are allowed, but the following characters are not: [ ] (square brackets), : (colon), / (slash), \ (backslash), ? (question mark), and * (asterisk). Sometimes, you want to rearrange the order of the Excel worksheets in a workbook or move a sheet to a different workbook. 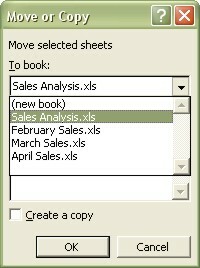 but if the workbook that already has a sheet with the same name, Excel changes the name to make it unique. For example, if you move a sheet named Sheet1 to a workbook that already has a sheet named Sheet1, Excel changes the name to Sheet1 (2). Click-and-drag the Worksheet tab to a new place. The black-triangle marker shows the new location. There are usually more than one way to move a Worksheet tab around. 1. Select the sheet that you want to move by clicking the sheet tab. You also can move multiple sheets at once by selecting the first Worksheet tab, hold down the CTRL key on the keyboard and start to click the sheet tabs that you want to move together. You'll notice that the selected Worksheet tabs are colored white. 2. Choose Edit ► Move or Copy Sheet from the menu bar. The Move or Copy dialog box pops up asking you to select the workbook and the new location. 3. From the To Book drop-down list, select the Workbook file that you want to move the worksheet to.